From the Baldwin County Courthouse, go west on Hancock St / Hwy 49 for 5.0 miles. The church and cemetery will be on your left. 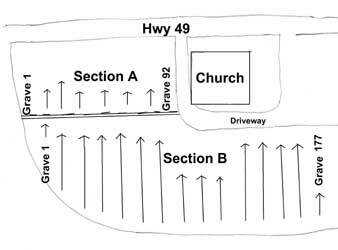 Note: from the intersection of Hwy 49 and the Hwy 441 bypass, go 3.7 miles down Hwy 49 toward Macon to the church and cemetery on your left. 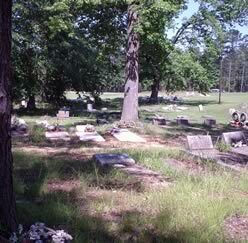 On same headstone as Richard Stubbs, Sr.
No death date as of May 26, 2005. On same stone as James Finney, Sr.
Musical drum and drum sticks carved on gravestone. Last digit of birth year is broken - best guess. Georgia TEC 4 259 Sig Hv Cons Co.
Handwritten - difficult to read death year. Age 70. His memory is blessed. Age 78. Mosses spelled as shown. Unclear if Jr. goes before or after Jones. No s on the end of Stubb. Lord's Prayer written on a wooden cross glued on gravestone. Stone broken at first letter of first name.